VATICAN CITY (AP) — Russian President Vladimir Putin showed off his religious side during a visit Monday to the Vatican, stopping to cross himself and kiss an icon of the Madonna that he gave to Pope Francis. But Moscow’s improving relations with the Vatican went only so far: Putin didn’t invite Francis to visit. The Vatican said Monday that ecumenical relations between the Catholic and Orthodox churches weren’t really discussed during the 35-minute discussion between Putin and Francis in the pope’s private library, though Putin brought greetings from Russian Orthodox Patriarch Kirill. Rather, the discussions between Putin and the pope, and then Putin and the Vatican’s top diplomats, focused on Syria and the role of Christianity in society. Putin thanked Francis for his September letter to the Group of 20 meeting in St. Petersburg, in which Francis urged world leaders to abandon the “futile pursuit” of a military solution in Syria and lamented that one-sided interests had prevented a diplomatic end to the conflict. Francis mobilized hundreds of thousands of people around the globe to participate in a daylong fast and prayer for peace, as the U.S. threatened military strikes following an Aug. 21 chemical weapons attack near Damascus. Moscow opposed military intervention as well. Francis gave Putin a ceramic mosaic of the Vatican gardens, and Putin presented Francis with an image of the icon of the Madonna of Vladimir, an important religious icon for the Russian Orthodox faithful. 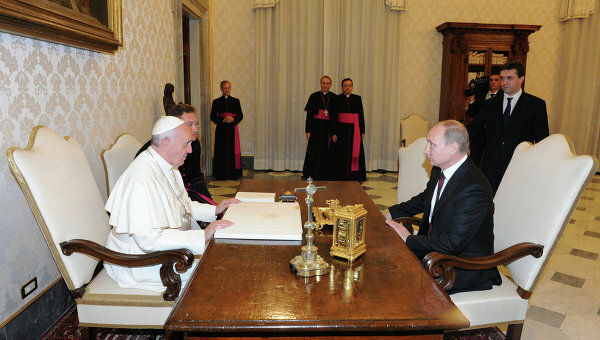 After they exchanged the gifts, Putin asked Francis if he liked the icon, and Francis said he did. Putin then crossed himself and kissed the image, and Francis followed suit. The Argentine pope is particularly devoted to Marian icons. Long-running tensions in Russia between Orthodox faithful and Catholics in Russia prevented Pope Benedict XVI and before him Pope John Paul II from achieving their long-sought dreams of a Russian pilgrimage and meeting with the Russian patriarch. Recently officials have floated the idea of a meeting in a third country, but the Vatican spokesman the Rev. Federico Lombardi said ecumenical issues weren’t discussed Monday. He confirmed that Putin didn’t invite Francis, making the Russian president one of the few world leaders who have visited the popular pope and not extended an invitation in exchange.